After a fun night on Bourbon Street, we weren’t quite ready to leave New Orleans, so we drove back to the French Quarter this morning. We were following the GPS when we stumbled upon the French Market. We parked Lady T on a side street about two blocks away and walked over to check it out. 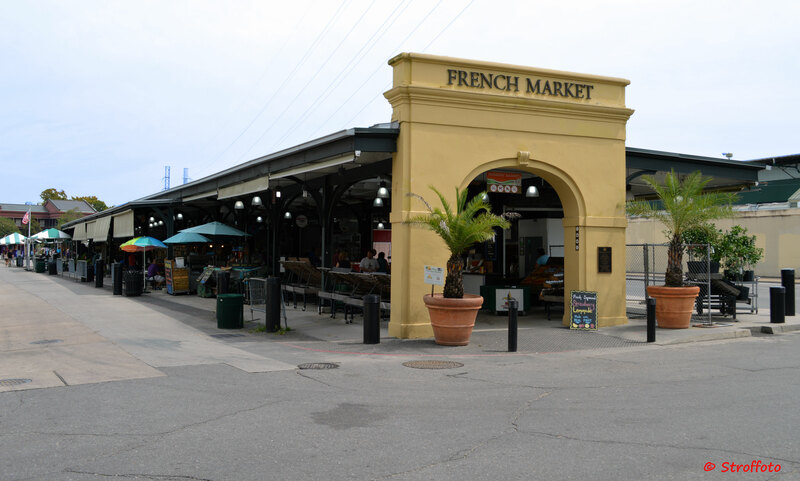 The historic French Market spans six blocks and sells everything from souvenirs and local art to seafood and fresh produce. We browsed the many vendor tables and as we approached the food court, a sign in front of a small vendor cart caught my eye. It read “3 Potato 4, Everything Vegan & Gluten Free”. I was so excited to see this place, as it’s the only vegan food that I’ve found since we started the trip. Also, they specialize in my favorite food lately, potatoes, which are served with homemade vegan dipping sauces. Jay and I shared an order of delicious wedge potatoes with a Garlic Pepper Mayo that was incredible! As we were getting ready to leave, Jay asked me to check the National Parks Passport to see if there was anything close by. Good thing we did because the New Orleans Jazz National Historic Park is directly across from the French Market! We put more money in the meter and walked back to visit the park and have our passports cancelled. We arrived at the park just in time for a jazz history lesson and a few tunes by the house band, This was definitely the coolest national park we’ve visited so far and it should be on the bucket list of every jazz fan! Finally hit the road around 3:30 PM and we’re currently at the Natchez, Mississippi Walmart. Tomorrow, we’re going to visit Natchez NHP and Vicksburg. Don’t forget to follow us everywhere as we continue our 2015 road trip!